For Watney to get the oxygen from this CO2 is easy. In the Hab is a device called the oxygenator whose purpose is to take in the CO2 exhaled by humans and extract the oxygen. Next he needs the H, in H2O, the hydrogen and that calls for a chemistry hack. During the crew’s landing in the MDV they hadn’t used up all the fuel, which includes hydrazine, N2H4. Separating the N2 (nitrogen) from the H4 is easy, he just runs it over an iridium catalyst, also available in the MDV. A side effect of the reaction is the release of some leftover ammonia, NH3, but this is mentioned in passing as a nuisance. The rest of the rig is neat. He creates a chimney from a space suit’s air hose and arranges it so that the hydrogen (hot from the reaction) rises up it. A flame in the chimney burns the rising H2, combusting with oxygen in the air and leaving water: H2O. What it actually leaves is humid air which the Hab’s water reclaimer turns into liquid water. The flame itself comes from splinters of wood cut from a religious cross belonging to one of the departed astronauts. Watney ignites the splinter using an electrical spark in the presence of a little oxygen. His efforts don’t go off without mishap though. He fails to notice that some hydrogen gets past the flame in the chimney and accumulates in the air. On realizing this later he measures the air as 64% hydrogen, a very explosive amount in the presence of oxygen. So he decides to reduce the oxygen to 1%, and then burn off the hydrogen a little at a time. The problem is that the Hab’s air regulator that decides how much oxygen is allowed in the air won’t let it go below 15%. To trick it, he tapes an oxygen filled bag to one of the regulator’s sensors, at which point it thinks there’s way more oxygen in the air than there is, and proceeds to allow the oxygen to get down to the desired 1%. The MAV comes with a Radioisotope Thermoelectric Generator (RTG), a generator containing 2.6 kilograms (5.7 pounds) of plutonium-238. This gives off just shy of 1500 watts of heat which it then uses to produce 100 watts of electricity. And of course it contains abundant radiation shielding. Its purpose was to generate power for producing fuel for the return trip. Watney makes use of this easy energy source a few times. To use Watney’s own words, “As with most of life’s problems, this one can be solved by a box of pure radiation” (from log entry: sol 199). The first time, he uses it is to help heat Rover 2 during an expedition to find Pathfinder, a NASA Mars lander whose mission ended in 1997, the one that contained the first bug on Mars. Using the RTG as a heater turns out to be almost as simple as just sitting it in the rover. However, it makes too much heat, and so Watney uses a hammer to remove plastic sections and solid foam insulation from the rover’s walls, allowing some heat to escape. As story progresses, Watney needs to make a much longer journey to Schiaparelli crater, again in Rover 2 and to have enough breathable air ne must take the air regulator form the Hab along for the ride. As mentioned above, the air regulator analyses the air and controls the amount of O2 and CO2 present. To do that it first does spectroscopy and then separates the gases by supercooling them. Luckily Mars is often cold enough that much of this cooling can be done by simply running the gas to a compartment located outdoors. The problem is that the cold air then has to be reheated so that it can be breathed. And for his long journey in the rover, that would take too much power. 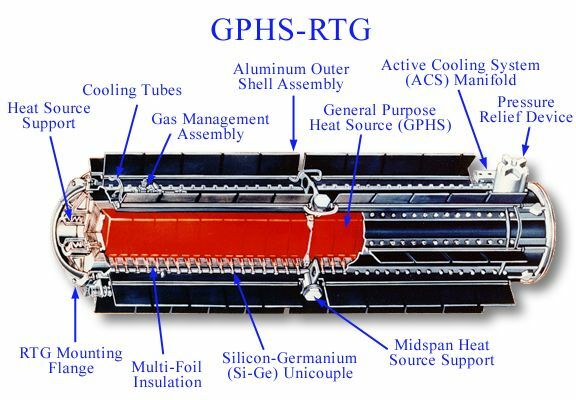 Enter the RTG, that seemingly infinite heat source. Watney runs the regulator’s cold air output hose down into a plastic box where he coils it up and pokes small holes in it. He then fills the box with water and submerges the RTG in the water. The RTG heats the water while the cold air enters via the hose. It then leaves the hose through the small holes, bubbling up through the water, and being heated up at the same time. 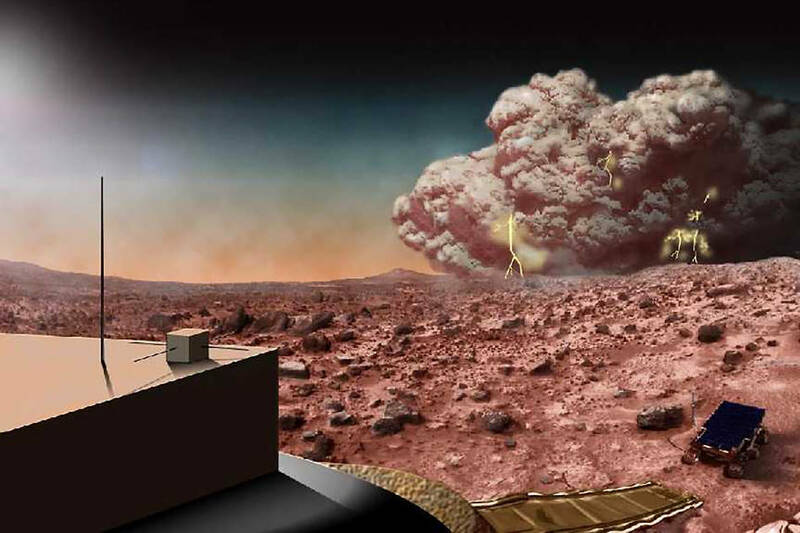 During the journey in Rover 2 to Schiaparelli crater, Watney encounters a dust storm in his path. He needs to figure out in which direction the storm is moving and the shape of the storm, so that he doesn’t drive into it where it’s getting thicker. Since he gets his power from solar panels he immediately looks at the previous day’s power generation and see’s that it was 97% of optimal. Solar power is generated from sunlight and the dust obviously blocks the sun. That gives him an idea of how to figure out the storm’s shape. He’ll make simultaneous solar power generation measurements at different locations in the storm. For that he’ll drop off a solar panel, drive south 40 kilometers and drop off another one, and then go south another 40 to drop off one more. The amount of power each generates over the same period of time will tell him where the storm is thicker (higher efficiency loss) and thinner (lower efficiency loss). To do the measurements simultaneously he carefully strips cameras from an extra EVA space suit he’d brought along. His electronics kit includes plenty of power meters, so each camera would film one of those. The cameras insert a time stamp into the lower left corner of each image. That all goes in a sealed container, and to keep it all warm during the Martian night, he has some of the power go through resistors, which heat up. All of this is powered by the solar panels and some backup batteries, also taken from the EVA suit. Preparing all that takes time, after which he measures how much power his regular solar panels have generated. Power generated had dropped from the previous reading’s 97% to 92.5% of optimal. That tells him the direction the storm is moving, west. Making his 40 kilometer steps to drop off the panels and then retracing his steps to get them back, he finds the northernmost one recorded a 12.3% efficiency loss, the middle one 9.5%, and the southernmost 6.4%. That means the shape of the storm is such that the thickest part is north of him. He therefore drives south, then continues east as he was doing before. During Watney’s long journey in the rover, he has to figure out his latitude and longitude without landmarks. Mars’ axis points at the star Deneb. Knowing this, Watney figures out his latitude using a sextant made of a hollow tube for looking through, a string, a weight, and something with degree marks on it. Longitude, however, has historically been a harder task, having required the invention of an accurate time piece, no mean feat if you want one that works on a rocking ship on an ocean. Fortunately Watney has abundant computers all giving him the current time, and he has the moon Phobos, which orbits Mars in under a Martian day. To get longitude he simply observes when Phobos dips below the horizon and plugs the time into a complex formula he worked out. Perhaps my favorite hack from the book was the ingenious use of solar panels to measure the thickness of the dust in the dust storm. Not that we haven’t seen clever uses for solar cells before, this ball balancing wheel is one such example. What hack struck you as the most clever, or perhaps one that you’ve done yourself, from either the book or the movie? Maybe it was one that we missed? Let us know in the comments and please try to keep the comments spoiler-free or at least give a warning first. ← Graduation Cap Shows Us What It’s Got! I didn’t read the book, I saw the movie. Read the book, goes into a lot more detail the movie could not do. A book to STEM by. The movie is (necessarily) an adventure piece, like many before it. The book is something almost unique – a chronicle of a succession of engineering problems and then how they were solved with the available materials and hard science. Very little handwaving involved; nothing magically appeared to solve the current problem that wasn’t plausibly required to be there in the first place or was explicitly mentioned as being present. And since Andy Weir posted the story online chapter by chapter as it was written, he couldn’t go back and edit in things if he wrote himself into a corner. I think he actually did add stuff that wasn’t there to make it work. I read everything and listened to his interviews I think I do remember him putting in things that were needed. But nothing that wasn’t realistic. One thing he does admit that wasn’t real world, was the fact the atmosphere was not thick enough to worry about a storm, but was necessary for his plot. @Ren: The “book” is a long blog interspersed with printed emails and transcriptions. A good portion of readers find it insufferable, and never finish. Whereas I couldn’t put it down. Yes, I found that too – did not even finish the book. Not keen on swearing – but that is just me. Loved the book but agree swearing so much was not needed. Yeah the book has a lot more, which is usually the case. Though I thought they did an awesome job with the movie, and keeping it faithful to the source material. I have both the book and the audio book. The narrator of the audio book did an excellent job, and I actually prefer listening to it vs reading it. Yeah, me too. I think the movie did an excellent job staying true to the book. They had to cut some stuff out of course to make it manageable. But what’s left is very faithful to the book. Andy Weir and how he wrote it and got it published was a hack in itself. For the part where he needed the crew to come back to Mars he had to write a simulator program to make it accurate, very cool. He wrote the book using blogs and people gave him feedback to improve the book and make it accurate, almost like open source. Then he moved the book it to amazon to others could down load it easier as a ebook. While he was do his day job programming, in the same week he got a book and movie offer, amazing. So the whole thing was an ultimate book hack. That was a great book. I heartily recommend it. And I really enjoyed the movie too. I’ve seen it at least five times already. I would say communicating using pathfinder and ASCII as well as the code inserted to use the rover as a texting client through the link was pretty great. It caters to my love of fixing old tech and the old adage “mars is the only planet in the solar system inhabited solely by robots” and interestingly a lot of them still work. Also, I don’t count venus because a puddle is no longer a robot. Definitely a great book, and the movie is one of the better book adaptations I’ve seen. As expected, there were some details lost, but a surprising amount of detail made it from the book to the movie. I read the book twice, almost back to back, when I first got it. I think it might be time to read it again. For me the whole “realism” of the book was completely dispelled the moment he had to *find* a PDF with the ASCII table on the laptop, instead of just writing a one-liner to print it. Also, the fact that reading just one Agatha Christie book took him days. What? Those books are written so that you go through them in hours, forgetting to eat and sleep in the mean time. There is more stupidity like that behind the seeming “realism” of it. Besides that, who doesn’t know ASCII? Well, I don’t. But I know A is 65, a is 97, 0 is 48, space is 32. And I think ! is 31. You can pretty much work the important bit, the letters and numbers, out from there. Also, if you look at the binary, you’ll see “a” and “A” are one bit different, as are all the capital / small letters. “0” is 00110000. It looks a lot like it was arranged to make building teletypes easier, with the higher-up bits selecting upper / lower / numbers and symbols. Uh, Watney is a botanist, right? Last I looked, flowers don’t grow when fed 7-bit control codes. The movie was surprisingly awful. And actually less scientifically accurate than say star-trek. I would advise you to not bother watching it – unless you are one of those really messed up Americans who go for that overly sickening ‘American patriotism’ film genre that makes a normal person nauseous. But China saved the day, in the movie anyway. They had to portray them as technologically a bit backwards of course, sigh. But yeah the role of China was surprising nonetheless. There’s a lot of Chinese who like to go to the cinema. PRC (China) has a very aggressive program for a robot mission to MARS by 2020. Dark side of moon by 2018. So I think they might beat USA for a manned mission to MARS some day. But this begs the question: “WHY?” What the hell is pushing these people to go to this red desert in space with absolutely no extant life, no precious minerals, huge dust devil storms, thin atmosphere, and water only at the polar ice cap? I can see why a NASA sanctioned private industry (Mr. Naveen Jain) will send a returnable rover to moon later this year because of all the gold, platinum, and HE3. But none of that stuff is on Mars.So why go? I agree there will be many surprises on Mars that no one expected. However, none of them IMO are worth the effort of a dangerous manned mission. It seems that there must be something we are not being informed as to the impetus to get there with humans aboard. Mars is littered with robots right now – and that’s OK IMO. And not just from NASA. I would bet that at least 1 of the Russian probes is sitting in pieces on the Martian plains somewhere. The 2nd one may be there too or orbiting the sun. Okay, here’s the story beginning. A tremendous dust storm occurred at the beginning of the movie. (As mentioned elsewhere, a dust storm of this magnitude can not happen on the Red Planet). The landing party was forced to evacuate before the storm blew over their ride out. In the blinding dust, Watney gets lost. The rest of the team has to launch because their rocket is beginning to tip over in the wind. After the dust (storm) settles, Watney finds himself alone and alive (barely) with a piece of the long range antenna sticking into his spleen and it destroyed his medical telemetry. They want to reenact scenes from Total Recall. Uummm… I guess you haven’t seen some Martian footage of dust storms. The dust devils reach a staggering height unlike anything on Earth. They are scary to look at too. I incorrectly call them Martian tornadoes. The Cydonian Plains was completely covered not to long ago from one mostly covering up that very interesting artificial effigy Richard Hoagland just wont let go of. NASA still is trying to say it’s just a trick of light and fractal geometry. They are wrong of course. Wait until they find out what’s next to the effigy. I’m not sure but I think Curiosity will or has visited already. NASA has their air brushes ready! 40.75° north latitude and 9.46° west longitude. Not to worry there is no life whatsoever on Mars “any more”. JWHITTEN – I meant USA/EU too not just China. notarealemail – Total Recall was wrong about the Martian atmosphere. That scene where the guy’s face blew up or something like that was totally wrong. There is enough breathable atmosphere on Mars to last you a couple of moments breathing and without a spacesuit. However, it would be akin to breathing at the top of Mt Everest. I’m only guessing here. The overexposure to solar radiation and Martian massive wind storms would probably get you first. asheets – Arthur Clarke was plugged into “something”, quite strange how his track record was. Still can’t figure out how he knew stuff ahead of time. Io is a hell hole! The ocean is completely LAVA! Can’t send anything to that surface… it would melt. Why go to Mars you ask? Because it’s our closest neighbor, because it expands our technologies 100-fold, because it extends man’s reach into his own solar system, because it gives him new frontiers to conquer, because it helps him grow intellectually as well as collectively, because it can serve as a safe colony in case man is stupid enough to destroy his home world (a very real possibility), and perhaps the best though most illogical reason of all, because it’s there! The reasons are endless if you think about them. Robots are a tool to get there, nothing more. These may seem intangibles to some but all of human exploration has been built on intangibles. The need to leave a stifling existence in one location for a risky attempt to start a new life in another is an indelible part of the human spirit. I encourage these efforts wholeheartedly even though the risks, as Isaac Asimov once said after the Challenger Accident “may cost us from time to time”. kmpres – Don’t get me wrong, I’m all for Mars exploration WITH ROBOTS! Yes, I know NASA’s mandate is to use robots to path the way for humans. I just think that is careless thinking on NASA’s part. Old school old timers are pushing people like Charlie to keep manned-missions alive when they should be sunsetted and shuttered.We can achieve ALL lofty goals with Valkyrie. Just like with our DoD and DARPA, we are minimizing human causalities during war-fighting with automatons. Boston Dynamics and iRobot are doing some amazing things these days in that area of research. Certain Asian countries are going way beyond the collateral damage safety-curve with theirs. I loved JFK’s speech but it was not as forward sighted as you may think. Dr. Stephen Hawking believes we are going about this all the wrong way. It’s like we are children (metaphorically speaking), and we hear a noise outside from say our “neighbors” and we carelessly venture outside to see what it is or see what’s out there. Yes we increase our knowledge-base and come up with new strategies and technologies, but like Dr. Hawkin fears we may awaken something unknown we can’t handle right now. Imagine the Star Trek TNG scenario in where just by happenstance the BORG are made aware of our existence. I know its all science-fiction, but Asimov and Clarke all predicted some things that did come true. Dr. Hawkin is a science-fact guy not fiction. I’d rather send in the robots and risk their very replaceable lives rather than astronauts. Let them work at JPL in Pasenda to watch the robots play. Robots don’t require KCN either. Also like in that new movie, astronauts could bring something back we can’t see or handle. Robots, not so much as they don’t come back. And what if we TAKE something bad there. Like the way we did recently with the Huygens Probe on Titan. I’m sure the Titanians really appreciate the radioactive RTG gift we left them (i.e. just humor – chill out!). Substitute Mars for moon, all the reasons are still valid. I’d much rather be exploring new places than trying to live forever on this same rock. …and also to get as far away from fidget spinners as possible. Why wold there be no precious minerals/metals on Mars? I mean the only way there were not is if something cooked them off or took them away. I’m sure there’s plenty of stuff like that on mars. Whoknows – For that matter what happened to Mar’s atmosphere? Did it “outgas” some how? What happened to it’s magnetosphere? What happen to it’s water? What happened to it’s “alleged” vegetation? What happened to it’s arguable yet plausible speculated ancient life-forms that left behind all of that artificiality on Mars? There is evidence that at one time Mars was possibly once very Earth-like. Evidently something catastrophic occurred there at some point in time which turned Mars into a global desert devoid of anything. Many nations have sampled Mars soil and allegedly found nothing of value to humans on Mars. However, on our moon and a comet called Psyche, well that’s a horse of a different color all together. They are both the mother-lode! We will find out for sure later this year or early 2018 when Space-X launches the next unmanned lunar expedition to bring back soil samples. IMO it’s not much more than rust, ice, and frozen methane. Are you sure you watched it? I found none of the things you talk about to be remotely true. If anything there was the sin of omission of some details to make it fit into a normal runtime, past the already mentioned plot device with the atmospheric density problem. And I didn’t find it particularly “patriotic” in the least, in fact the space agency looks pretty messed up in many scenes. I agree with you, great details and held to science true, he worked hard at it. I talked to a NASA leader that I know and they all loved the film and its realism. Realism.. come on now. Yes they paid some people and it was a PR thing in a way where even Obama came out advertising it, but if you aren’t being bribed or otherwise have a reason to join the BS parade and look at it objectively you’d roll your eyes into a way that will requires medical attention. Any touch of realism was immediately negated a few minutes later by cringe-worthy unscientific and incorrect tripe. As for the ‘no patriotism’.. seriously you MUST be joking. That’s my suspicion as well. Troll army? I guess not savoring bilge is automatically anti-American these days. Makes sense. I rather enjoyed the movie and may read the book some time when I can spare the time. The one part that was most unbelievable for me, however, was the cracked helmet scene and the emergency patch job with good old duct tape. Maybe the duct tape would have worked depending on the pressure, but a glass helmet? Seriously?? Hasn’t Hollywood heard that Plexiglass doesn’t crack? Even auto glass is laminated and has a plastic sheet in between the layers to keep it from cracking in accidents. It will craze but it won’t crack into pieces larger than a pea. We’ve had that since World War 1. That always bothers me. So many space movies use that trope. Notably, 2001: A Space Odyssey and Iron Man avert this pattern. > guess what’s in the end of the boom microphone in those helmets just in case of scenarios like Watney’s? Uh, an electret element that is the microphone? If you want to commit suicide in space, it’s pretty easy: Let the air out of your suit slowly. You fall asleep and never wake up. Painless, just like passing out during a free dive after hyperventilating. The urge to breathe comes from too much CO2 in your blood, not from lack of O2. Space is lethal enough, no need for cyanide. Can an astronauts even choose to dump out the air supply? Yeah, how could the Colonial fighter pilots in the original Battlestar Galactica even see their instrument panel, much less beyond the cockpit with all those lights shining in their faces? You mean the helmet with no visor and what looks like street clothes and a suede flight jacket instead of a pressure suit? I don’t think Battlestar Galactica (1978) was even trying to pass itself off as “hard sci-fi”. It was because of Battlestar Galactica that I first read about helmet light syndrome. It was cool that the helmet design was based on a Erich von Daniken photo in one of his books (I was into his books when in Jr High, it made for interesting discussions at the nerd table during lunch). The lights bothered me too, as did lots of other things, but what stood out was the hole and cracks in the helmet. The lights are just there so we can see their faces (it is a movie after all), the cracks are an anachronistic plot device constantly recycled by ignorant screen writers. On a somewhat related note, what annoys me is that whenever there is a movie with a ballistic missile (ICBM) the missile always arrives complete with the first stage and with engines running right until impact. I guess they don’t teach the word ballistic at film school. And you see it in ALL movies and TV shows even the ones that try to be serious. Hell, you even see it in documentaries. . The Pathfinder reboot sequence was my favorite…. Actually you can grow a lot more than potatoes on Mars. The soil does have nutrients just not everywhere on the planet. NASA would have sent Watney with more than just potatoes as NASA knows the Martian soil content. ISS is already growing plants in space hydroponically. Even the ancient Babylonians knew how to do this (i.e. Hanging Gardens of Babylon – In Iraq today). Coincidentally, (and arguably), Percival Lowell, Giovanni Schiaparelli , and the Royal Observatory all allegedly eye-witnessed artificiality on Mars during turn of the 20th century. Lowell claimed he saw vegetation and artificial water channels feeding them. These famous men were not crackpots nor tin-foil-hats. They were credible and well funded scientists with state-of-the-art equipment, some better than telescopes today. Lowell predicted Pluto’s discovery, so they knew what they saw and were quite qualified to offer their observational expert analysis despite all of the mainstream academic skeptics today trying to debunk Lowell unsuccessfully. So NASA “knows” stuff can grow quite well on Mars with water. So Watney could have survived the 4-years. Despite the fact the rescue mission would already be half-way there if you know how NASA thinks after Apollo 13 (et al). When HaD covered this topic several years ago, I recall potatoes were chosen because of the high energy density (starch) they have, which would allow a smaller space to grow them. I mean, in the story, no attempt was made to have the marstronauts grow any food. Just explore. Ren – Also NASA already has a provision for water for astronauts called the NUR. Watney (in the future) would have had this very sophisticated hydration system. However, he could have trekked to Martian south pole in his rover and melted some ice and returned. Surviving for 4-years would have been a “cake walk” for Watney. Or failing that he could ingest the little red KCN pill in the boom microphone chamber and then the NASA Mars rescue mission could just RTB. Japanese astronauts have a blue pill in case they meet a tentacle monster that is not very pretty. Yes to all who mentioned the O2 dumping. It’s all a matter of choice. If you ask Buzz Aldrin he will tell you, it’s ASKED during pre-launch astronaut briefing what method for the “unthinkable”. NOBODY says I’ll just see what happens when I get there. Everyone wants OPTIONS. It’s just an option you volunteer to do or not do. KCN is quick and relatively painless. Asphyxiation sounds a bit gruesome to me like drowning. It’s NEVER a forced mandate. I think everyone would want the freedom of choice when the chips are down (i.e. Apollo 13 – which finally went well in the end BTW). And some astronauts like Buzz belief in some sort of after-life too. Even if you don’t. And yes I got that ELECTREC mic crack (i.e. sarcasm). That’s obvious. But if you are in a sealed EVA (spacesuit) how can you get to an ostensible KCN pill THROUGH your helmet with your hands. You can’t. Also you can’t turn your head to another helmet flank chamber. The best place to conceal it is near the end of the boom mic enclosure where you can manipulate open with your labial commissure and ingest (voluntarily of course) just in case the unthinkable happens. I don’t think the KCN is always there either. I think the astronaut puts it there before EVA, and puts it b ack in it’s exterior container after returning. I’ll bet it has a clever (and funny) label on the container too. Like Bugs Bunny committing suicide? I know NOT funny subject matter!!! NASA (Never A Straight Answer) is all over the public perception of itself and therfore the government. In a hypothetical scenario where an astronaut can’t return from a spacewalk, what sounds better? 1. Astronaut dies relatively peacefully under his/her own choice. Personally, I doubt they would use a KCN pill. They probably have something with fewer… side effects. 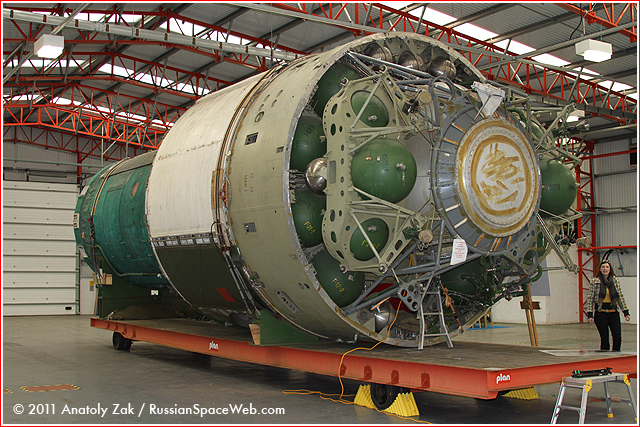 Also in space several decades ago, TP-82! Not for fighting spies or aliens haha, but for hunting for food if the Cosmonauts crashed in the middle of nowhere! notarealemail – My understanding of KCN is that the “side effects”, as you say, are moot. I heard that 0.3g can cause critical heart failure within minutes. However, all of that shortness of breath and other really bad stuff happens while the victim is unconscious from the KCN in seconds. Also NASA could get the stuff from the same place Jim Jones allegedly got his lethal Koolaid batch from (i.e. common knowledge per the Internets – 8-| ). I think it is from a very concentrated apricot or apple seed solution I think. Even Alan Turing had access to it from somewhere nebulous. Astronauts aren’t the kind of guys who would ever commit suicide(at least during the mission). They’re amongst the best-trained and strictly selected test pilots and scientists of the planet, prepared for every eventuality. If they’re able to frickle some red pill out of their microphone, they might as well get to work fixing their situation until they drop dead or return home. There isn’t even really a thinkable scenario where a spacecraft crew would be alive and certain that they have no hope of ever returning. Even during the Apollo missions, how could you be alive, stranded on the moon, and not be trying to fix the issue of your spacecraft? It’s not like you had time for getting melancholic when things go south in space. Marian Keller – I agree with you 100% Marian. But that’s NOT what we are talking about. We are talking about AFTER you’ve expended all avenues of situational mitigation, and you are now USCWAP (up sh** creek w/o a paddle), and theree is no hope of rescue, your O2 panel says you have 20 seconds of air left, your tether broke during EVA, your EVA suit got hit by a golden-BB and slowly leaking (and no duct tape nearby), your face mask has micro-cracks from those BB’s and getting worse every second, well need I go on on this clusterphuq scenario? It’s now a matter of “Do I wait for the inevitable or do I end it now?” Buzz would say “Going home y’all!” due to his background as a pastor in his church. We were not talking about pulling the plug at the first sign of trouble, sheesh! I think most people have some misconception about the space program. It’s not about the destination, it’s about developing the technology to get us there. We all benefit from the little bits and pieces that spinoff the journey. It’s just a goal, but there will be a lot of thought, a lot of work, and a whole lot of new technology developed to make it possible. Think the Mars mission has been in the works since the moon landing. Why Skylab or the current space station, and not a moon base? Moon has some gravity, where the space station does not, and it’s a very long trip to Mars. Like the way we developed new technology during the Vietnam War? How’d that work out? No I think if you could talk to some NASA whistle-blowers (like Buzz Aldrin et al), you will see a creepy under-current of personal esoteric philosophies about Mars they don’t publish in NASA Tech Briefs. Director Charlie Bolden knows about them but won’t share that with you as it would make you doubt the entire Martian space program. We really DON’T need to go to Mars and beyond with HUMANS. The robots are just fine and I cheer that on wholeheartedly. I love automatons. We even could do it with mandroids which NASA has already kinda’ sorta’ started already. Wait until you see NASA’s VALKYRIE. Looks like Optimus Prime from Transformers movie only it’s white and doesn’t transform into anything. +10 The Moon has many really great possibilities. Given thin air versus no air, vacuum is a lot better. And multiply the size of a domed stadium by six then add 15 meters of lunar soil for radiation protection and you have nice roomy places. They can be as big as you want if you add more structural support than just atmospheric pressure. A human can lift and move 400 pound mass loads (180kg) with ease, clear 18 feet in a jump and jump to grab higher. In fact, you could clear a semi truck and trailer lengthwise. A running jump can clear a 120 foot gap. Plus you can have the room to do these things. Robotic equipment can use much smaller motors and structures. Nearly everything gets a lot easier. Why would you want to go to Mars? And what happens when China or Russia or Iran set up first and land a big gun on the Moon? They will own all access to the Moon and to Earth orbit. This is a clear and present danger that should be a serious concern. I’m not sure how to take it though. Only certain types of space weapons are allowed, but that still means that they allow weapons in space! We have confirmation that China has an anti-satellite weapon, and tested it out. Search for fy-1c. The book owes something to what could be considered its 19th century precedent: Jules Verne’s ‘The Mysterious Island’. It’s an epic novel about a group of Civil War castaways who steal a balloon and after a storm land on an uncharted pacific island.They literally have nothing, but bootstrap their way up to a mini society by making things from first principles – pottery, gun-cotton,fortifications, a wheat plantation, water power, even an electric telegraph. Verne actually gives quite plausible details about how they go about it all. The castaways are mysteriously helped by some unseen presence but I won’t spoil it for those who haven’t read it yet. If you liked The Martian, you will love ‘The Mysterious Island’, IMO one of Verne’s best, and my favourite survival story. I forgot all about that one, it’s been so long. I should pull it off the shelf and have another read. Thanks for the reminder! Robinson Crusoe – survives because of all the ready made goods he salvages from his boat. The Martian – survive because of a good grasp of science, a good library, and a lot of salvage. Robinson Crusoe – Was ostensibly a plagiarism from a real life surgeon who was shipwrecked in the Caribbean Sea off Trinidad after his prison break and was saved by a native American (Miskito Indian) named Will (aka Man Friday?). Mysterious Island – Although completely sci-fi, they were saved by Capt Nemo (which means “no one” in Latin). However, as in most Anglo-Saxon themes they always egotistically refer to their utter survival by their own acumen and prowess. But look at their list of men. Who is NEB? Could it be that Neb’s ancient survival instincts could have been much more plausible to their island survival, as America’s past success was built on Neb’s people’s backs? The Martian – I think Watney’s overall survival on Mars was based on his NASA intense wilderness survival and Mars-specific training and his personal education his parent’s ostensibly paid for – not just and exclusively him. Also thanks to the early work of the NASA female employees in the movie HIDDEN FIGURES (2016), Watney can thank them for their early complex work on the maths involved in getting them to Mars and back. These women were also genetically related to the fictional character NEB above – if you get my drift? Excellent must see movie. Sheldon Cooper (TBBT – Jim Parsons) is in it. To just equal the force of the slowest Earth wind that’s hurricane force (33.5 meters per second), Martian wind would have to blow at over 240 meters per second. Typical Martian dust storm is about 96 KM/h (60 mph) which is half as strong as Earth hurricanes (aka typhoons, cyclones, etc). Below is a NASA artist illustration of one with plasma discharges (i.e. lightning). Have you ever seen an Earth dust storm like in that TV car advert in where the Land Rover rescues some running sailors from a HUGE dust storm in some Arabic desert? Or like in the Tom Cruise movie (Ghost Protocol???) in where he is scaling a Saudi skyscraper while one is approaching in the distance? Mars is like that almost daily. Sometimes they cover the ENTIRE planet about every 5 ~6 Earth years (3 +- Mars years). So yes Earth is more intense than Mars dust storms, but Watney (Matt Damon) is just a human and not a very big or strong one either. He’d be a toothpick to a Martian dust storm. I really need to see this movie now! 60 mph wind on Mars is half the wind speed of an Earth hurricane, but not nearly half as strong. Because of the much lower atmospheric density, it would feel like a 6 mph Earth breeze. JDX – I agree with Michael Smith. He was the guy at NASA I was talking about that monitors Martian weather. However, his 6-mph wind explanation was really off topic. Yes a 60 mph wind would feel like that with Mars complex altitud-based winds. However, we are talking about fine dust particles traveling at 60 Mph not simple air molecules. They would still hit you at 60 mph and feel like it too. Also there is all that electrostatic energy or lightning. The only thing missing is pelting hail like on Earth. But without water that ain’t happening.I guess the dust particles are like our hail during a tornado? And what do we know about possible electrostatic levitation during mesocyclonic activity? Practically nothing. But we can see that it might happen here on Earth. However, the jury is still out on that one. That 60 mph speed clocking was done by Michael. So I think he is comparing apples to oranges with that explanation. 75 MPH is the minimum speed to be classed as hurricane force on Earth. Martian air is so thin it can’t pick up and blow any particles much over one micron, so even if they are moving at 60 MPH they still won’t have much punch. A lander design that couldn’t stay upright in the worst wind Mars can throw at it would be a stupid design. Even with a lander made to take the strongest wind Mars can produce should have guy wires, just in case of freakishly strong weather. The book needed an actually possible way to strand Watney and threaten the survival of the rest of them. Now there’s the absolutely must leave emergency situation that while highly unlikely to happen, could actually happen. Galane – I think JDX was referring to 120-mph hurricane winds on Earth. When air (wind) has particulate matter in it, it becomes much more dense, like with hailstones. Therefore, 1-micron of Martian dust in a empirical bona-fide verified Martian dust storm becomes an aggregate of gazillion microns of dust traveling at 60+ mph. NASA tracked the speed of the storms with radar on the MRO or MOM bird(s) (I think!). That was not thin-Martian air they were tracking, but the particulate. I think Michael’s criticism of the movie during this dust storm scene (which I have not seen yet), may be a a bit of a contradiction of stuff he has already reported to his bosses at NASA about such things. I would think Watney and his lander just might get clobbered by the Martian particulate matter not the thin Martian air. And yes, one would think that they would have thought to use guy-wires and dust storm detectors. But I guess the screenwriters just didn’t think ahead. I kinda’ think NASA would have been prepared for it though. They could have even used drill anchors into the Martian soil. I also noted a lot of tarps (aka plastic tarpaulins) in the preview. A tarp can become airborne in a 6-mph wind like a sail. I’m still wondering why the screenwriter had “tarps” around the potato farming operation. I know it was for greenhouse effect. But on Mars? Does that make any sense? Where the tarps the only boundary to the exterior of the HAB or farming area? I really need to see this movie (I keep saying that). The second hab unit he’s using to grow spuds has an accident, and it’s entry / exit airlock rips off. It depressurises. So he manages to bring it back to working condition, and repressurise it, by sticking some plastic around the entrance hole with sellotape. Maybe there’s some way of making it plausible. The air manufacturing equipment, sucking O2 from Mars’s air, wasn’t mentioned in the film, so I wondered where he’d get all that replacement air from. Overall there’s a lot of nonsense in the film. It’s OK but I’m not bothering seeing it again. One obvious problem was the guy sat in the rover in his shirtsleeves. Then he gets out, in his spacesuit, then gets back in again, back in shirtsleeves. There’s no airlock on the rover, so was he replacing the entire atmosphere every time he got back in? It’s not a great film, there’s many more rewarding ways of spending your time. Greenaum – I finally saw the movie and I liked it warts and all. The director admitted to some goofs with the dust storm. But there were many others tha notarealemail pointed out at http://tvtropes.org/pmwiki/pmwiki.php/Headscratchers/TheMartian – check it out. It’s a really in-depth analysis of the goofs. liked how Watney reinforced the tarp (or drop cloth) with duct tape (sellotape is what we call Scotch tape here in USA). That was a good idea as I thought all was lost at that point (aka USCWAP?). I did not know anaerobic bacteria was so necessary for growing veggies. I thought Mars horticulture was just “add water” and viola (i.e. French word?). I mean the nutrients are already there (allegedly). So mix up some more readily available shiat, replenish O2 from somewhere, get those spuds from the spud locker and start again. Also those spuds couldn’t be that dead. I know the Irish potato famine was one thing but thanks to Native Americans they helped save the day on that. It appears it had to do with fertilizer. Botany is hard! And why is Mars atmosphere depicted as being that harsh? I know it does get cold there and the O2 level is negligible. But it’s not a vacuum there and it’s not like Siberia at the “pole of cold” there. I would think the conditions on top of Mt Everest would equivocate it. Your head does not implode. But you might turn into a Popsicle though if there was any water there at Acidalia Planitia. His Mars suit is really to protect him from hypothermia, hypoxia, and shield from solar radiation. He actually could take it off and hold his breath for a few seconds. However, his cancer would have cancer as he said. I can’t see how the outgassing killed those spuds so darn quickly. Spuds are a hardy tuber. The rover did have a pressurization phase when the cockpit hatch closes. The woman’s voice tells you when it’s OK to take off your Mars suit and when to put it back on. The short-sleeves didn’t bother me. I love them. I just don’t think the Mars suit is that hard to work with as the EVA Suit is. When he got to the MAV he had to change suits before ejecting MAV panels to save on weight – or did I get that backwards? Just think when NASA sends Valkyrie (mandroid) to Mars.NONE of this pro-human crap will matter. They don’t need potatoes nor EVA suits. We are like “meat bags” to mandroids and they can do everything we can do only better. And they don’t need to pee or crap either. No it wont put astronauts out of work. They can work at Florida to Houston to Pasadena until retirement. The Pathfinder thing – why did that NASA guy (Kapoor) have to fly to Pasadena to be next to the replica? The feed could have been fed to Houston via the space network. The replica really had nothing to do with the Mars PF signal. Kapoor was the Director of the Mars Mission. He added no value in Pasadena micromanaging the JPL team. The PF did not need it’s twin in Pasadena to work. Watney could send his white board handwriting via PF’s video camera. The return messaging could have been a downlink from MRO or MOM orbiting above. All he had to do was repair the receiver antenna that was stuck in him once. He could do that with a piece of wire laying around. Listening to the NASA birds overhead was not that hard as phoning home from Mars with PF. And the PF had an RF module to receive commands from Houston for camera panning and other things. He could have just hooked up the serial port on one of his laptops to fetch that RS232C signal.They could figure out some way to convey human intelligence to Watney – no video/audio just text. Only needed a USB to DB9 serial cable. I first listened to the audio book when it came out. This discussion inspired me to listen again, maybe even watch it again, such a great story at so many levels. Finally watched the movie on Youtube for $2.99 (usd). Great movie. Way too busy for me to follow everything. I found it strange that NASA left a MAV ready to go several kilometers away with NO FOOD aboard. It was cool how NASA noticed him moving around before he made contact via the PathFinder lander’s radio. Why did NASA only connect with the other Pathfinder at JPL (the replica). Did that make any sense? Are they connected? I have many other questions I have too. In the end here is the NUMBER ONE enemy to us all from Mars!!! If you get a “hot linking error” just copy and paste https://goo.gl/LqMn8P into your browser and hit ENTER. This is VERY serious! IIRC they dug the Pathfinder out of JPL to use as a test bed for the stuff they were planning to do with the real one. To give them ideas on what might work. They mocked up a simulation on Earth. NASA have done that before, famously on Apollo 13 but also Skylab, and I’m sure plenty of other missions. Presumably the actual control of Pathfinder was done using computers and radio transmitters like it’s original mission was. I imagine by now NASA have some standards in place for communicating with probes, so it’d just be a matter of finding the frequencies and protocol, and using their network of great big dishes around the world. Greenaum – Hit CTRL-F and copy/paste in July 5, 2017 at 3:46 am for my response to this. I hated how they depicted NASA insubordination to the Director and the totally make believe “transparency” of NASA. Charlie Bolden is NOT required to tell the American public ANYTHING if he feels it’s in the interest of National Security to go dark on any subject he deems it’s needed. He actually can tell the POTUS to go bleep himself too if the executive order puts lives in jeopardy. Yes he will have to account to Congress later , but that’s not hard to stonewall them as our latest US-AG just proved was possible. And how far is the south pole from Acidalia Planitia (Ares 3 site) anyway? There’s water ice there. He could bring back some ice cubes from there in the rover’s trailer and melt them for later. Fooling with hydrazine to make H2O is just pure insanity. Ask any Habu driver about the dangers of hydrazine.Habu’s do not refuel their SR-71 Blackbirds on the tarmac.They just have enough to go airborne then do a mid-air refueling where it is safer to do so. In real life Watney would have been toast from that hydrazine explosion. If NASA had thought to send ARES 3 with a new Bloom Box for auxiliary electric power, the byproduct is water. Drinkable not so much. Just run it through the N.U.R. machine? Already done. SPOILER ALERT The movie MISSION TO MARS strands a person at the Cydonia effigy and they have to go back for him. The story’s more from the perspective of the folks who leave and come back than it is about the survivor though. Regarding spooky sci-fi authors, Jule Verne and H.G.Wells were very much that way too. Jules Verne with his submarines and rocket to the moon and H.G.Wells with his atom bombs.